While 80 percent of graduating college students expect their employers to provide them with a formal training program, 52 percent of those who graduated from college within the past two years say they did not receive training in their first job. Many soon-to-graduate college students expecting on-the-job training are likely to be disappointed. While 80 percent of them expect their employers to provide them with a formal training program, 52 percent of those who graduated from college within the past two years say they did not receive training in their first job. That was the big takeaway from a survey by Accenture that examined workplace expectations of upcoming 2014 grads and the workplace realities as reported by graduates minted in 2012 and 2013. The consulting firm interviewed more than 2,000 people for its survey. Not surprisingly, many new grads feel this trend in training hurts their chances to succeed in the corporate jungle. On the upside, those who had solid internships prior to graduating reported a high rate of turning the internship into a job — perhaps because it gave them insights into how the company functioned that earlier generations might have received through formal training programs. “Internships remain a good opportunity for graduates to advance to a paying job; of the 69 percent of 2012 and 2013 graduates who participated in an internship while still in school, more than one-third (36 percent) said the internship led to a job,” Accenture said. Its survey looked at how well colleges were preparing their students for the job market, and found that most higher-education institutions are doing a pretty good job of it, if not better than in the recent past. Accenture found that students who came into the job market and were forced to accept work outside their field of college focus, they generally blamed themselves for choosing the wrong major. The big disconnect, however, came in company training programs, prompting Accenture to offer a warning and what might sound like common-sense advice. Accenture expressed concern that, because it’s often the top grads who expect to be treated in this manner on their first job, companies risk losing that talent if they don’t actively attempt to develop the skills and knowledge of these new hires. The research drew out more data that supports Accenture’s concerns about talent development and retention. Of those 2012 and 2013 grads, 46 percent consider themselves underemployed today. 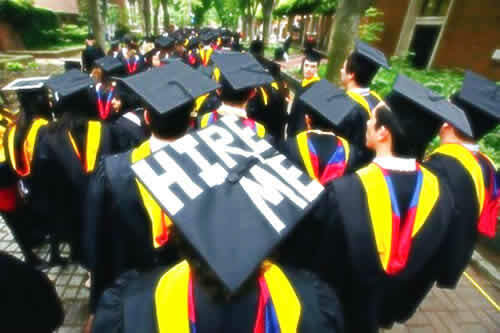 In the year-earlier survey that queried 2011/2012 grads, 41 percent reported that they felt they were underemployed. The 2014 crowd is more optimistic about job prospects than their cap-and-gown predecessors. More than eight of 10 said they expect to find a job upon graduation in the field they majored in, yet just two-thirds of the 2012/2013 grads were able to do that. Nearly seven in 10 “expect to find a job within six months of graduation, but only 42 percent of the 2012 and 2013 graduates said they did so,” the survey reported. 33 percent of this year’s graduates said they would be uncompromising when it came to salary expectations for their first gig, compared to 43 percent of those who were about to graduate in 2013.